Genuine goodness. Ready in 2 mins. Gluten free. Free from artificial colours, flavours and preservatives. 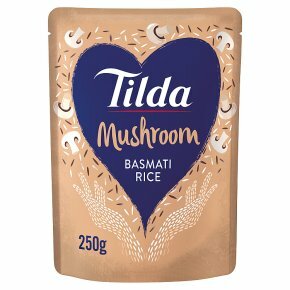 Suitable for vegetarians.Our Signature Recipes are crafter from Tilda Basmati along with the finest kitchen ingredients. The dark and earthy aromatic flavour of mushrooms comes alive when accompanied with our Pure Basmati grains. Why Not Try... Add crème fraiche and herbs for a quick risotto. Use as a filling for stuffed vegetables.